Can you help me estimate the capacity of a protein skimmer I acquired? 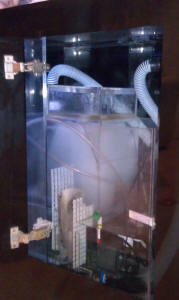 It is part of a custom made acrylic sump that was one piece in a whole-system purchase. I am now considering retaining the sump only, and upgrading to a larger tank, but don't know to what size/capacity this skimmer may scale. The tank it came with is 135 gallon capacity. Its measurements are 17.75" H (to top, where skimmer cup joins and sits on top) x 9.25" D x 8.75" wide. It is fed by two Danner Model 7 Mag Drive pumps, with venturi tubes attached. 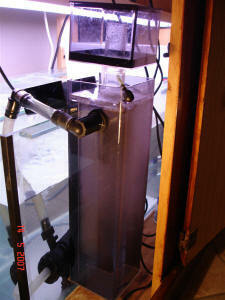 Its water height can be adjusted by an adjustable baffle. See picture, attached. 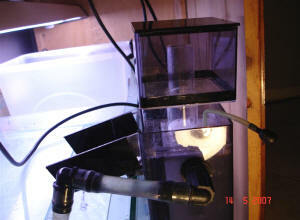 You can see the square-shaped collection cup sitting on top of the skimmer in action. The sump's overall dimensions are 17.75" H x 12" D x 24" W.
In the meantime, the skimmer has not been operational throughout due to Danner pump fixes that were needed. It is now in full operation, and pulling organics, but nothing significant. The picture shows the skimmer cup with a few days' worth of waste in it (note, I decided after taking the picture that the baffle level is set too high as it seems to be allowing non-skimmate into the collection cup). I'm wondering if another option on increasing skimming capacity would be to upgrade the pumps? Due to the acrylic work, it seems I'd need to use something with identical/exact measurements. I may send a picture of the pumps to Danner, and ask them whether the higher gph models would easily replace the model 7s to enable this. Also, I've recently noticed that while there is heavy air-mix action going on, the venturi tubes aren't tight-fitting. Maybe this is reducing its skimming capacity? Any other thoughts based on my responses? <Well if you upgrade the skimmer you will have to find one that would fit in that skimmer box and still be efficient enough to do the job. I'd probably just get another sump which would allow me to select a skimmer of preference rather than one that would fit. 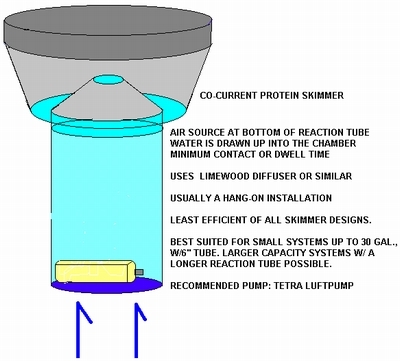 Guys I love your work, I need help with building a protein skimmer. I had a SeaClone skimmer that worked for awhile but has now stopped working. I wanted to build my own and have it setting in the tank. 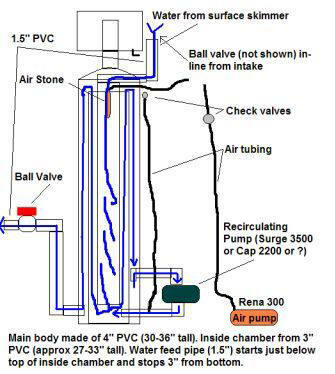 Do you have any diagrams where people have made with any success or should I just go out and buy another skimmer? 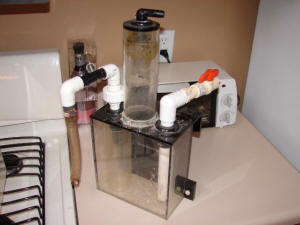 DIY protein skimmer Its a in tank co current model I made based on the diagram given in www.saltaquarium.about.com. <Definitely pretty impressive to be able to follow a diagram like that.> I am attaching the picture of the same. It also say its the least efficient skimmer as it requires lots of maintenance which makes me wonder why I selected this design. <Just trying it out? planning on doing another perhaps?> I assumed that the water will flow out from the bottom which I have kept it open. Its more than 24 hrs and my skimmer is till working. It produces much thick dry foam. But the greenish / brownish gunk is still not visible. ( Could it be that there are no fishes in my tank , the greenish gunk is not appearing )<Is it a brand new tank?> I stay in India and its really difficult for us to get good protein skimmers like Euro Reef , Aqua C etc etc... Even if we get, its very very very costly that we Indians cannot imagine to buy it. Nor we can buy it directly from a outsource as we have to make payment to the manufacturers in dollars which is not possible because of various government regulations. ( Dollars can flow into India but cannot flow out . hahaha )<Definitely a problem.> Anyway I will consider your advise and act upon it. <Good luck and please do let us know, MacL> I will keep u informed. Thanks Adam, for your immediate reply You guys are really doing a wonderful job.